baby | Oh! What a wicked web we stitch! This semester is almost over. Well, technically it is over but I have one last paper to write that I was given an extension on and it is one that I dread to write. In the mean while, I’ll catch ya up on things that I got done during the semester. 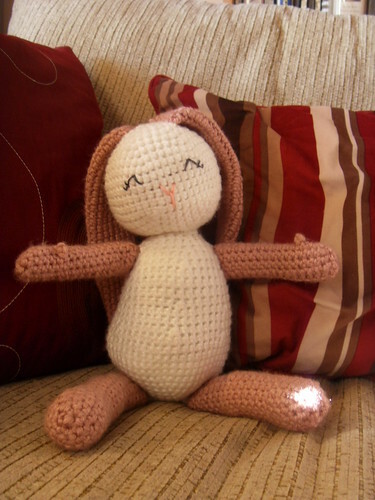 This little girlie bunny lovingly named, Hunny Bunny had been 2 years in the making. It started as the Lion Brand pattern ‘Best Bunny’. But I didn’t like that it was so small so I altered it as I went along and eventually it became boring and I tossed it aside while I did some other things. Poor girl was in a bin for nearly two years without her arms, tail and legs attached. One day while searching for some yarn, my now one and a half year old daughter saw it and gave it the biggest hug so I had to finish her. 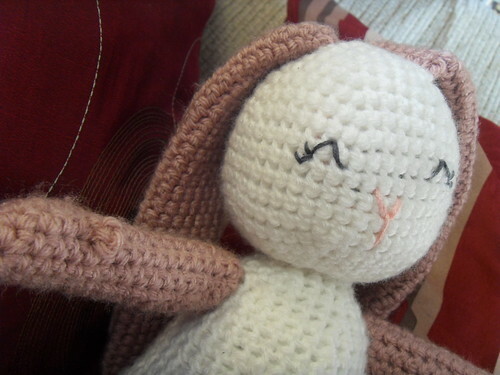 So here is Reli’s pretty Hunny Bunny! So perfect that this month is sewing month. Just a few days ago I was trying my hardest to follow a pattern for a toddler jumper (even though Reli is no where near being that size yet). After hours of frustration I gave up on it. I went into my room, got an old youth-large band t-shirt and scissors. I took out my frustration on a The Mars Volta t (awesome band BTW, shirt is a bit small on me and that’s why that one got chopped), completely mutilated it lol! But oh- what an awesome out come! I made my daughter an awesome little jumper to play in. It wasn’t hard or frustrating at all, it was actually very exciting! I couldn’t wait to finish and see how it turned out. It is a little big on her but big is good! She’ll grow into it. She’s growing out of everything so fast! Went scissor happy on one of my t-shirts. Love it!